When Did Gene Kelly Die? Gene Kelly, by Allan Warren, 1987. Wikimedia Commons. In July 1994, Gene Kelly suffered the first of two strokes. Although doctors at UCLA's Medical Center labeled it "mild," the stroke kept him in the hospital for nearly seven weeks. 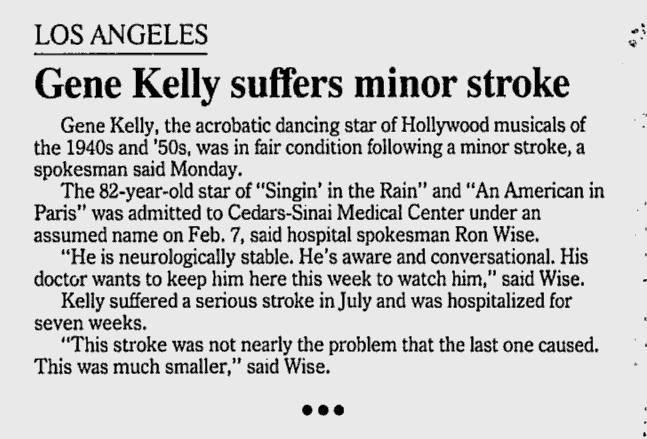 Kelly suffered another, much smaller stroke in February 1995. "He was neurologically stable, aware, and conversational," the Associated Press reported the following day. But sadly, Kelly would never fully recover from this one. He died on Friday, February 2, 1996. While Gene Kelly's death is sad in itself -- in that such an energetic man/body was overtaken by such a debilitating condition -- it is also fraught with controversy, at least according to Kelly's first wife, Betsy Blair. For example, in the epilogue of her memoir, Blair recalls that a few hours after Gene died, his third wife phoned Kelly's children (Bridget, Tim, and Kerry) to discourage them from traveling to Los Angeles; after all, at this point, there was nothing they could do. But the children insisted and flew to California to pay their respects to their father and to visit their childhood home on Rodeo Drive once more. 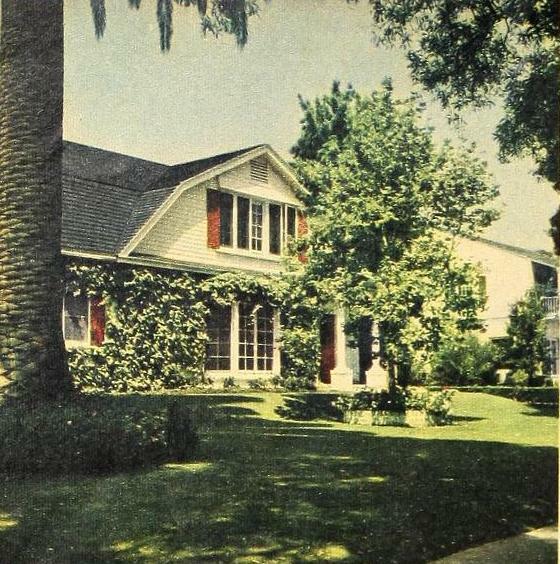 N. Rodeo Drive, Modern Screen, 1949-50. As Blair tells it, Kelly's adult children arrived to a somber house, "no friends, no food, no tears, and no embraces. They were given a tour of the flowers from famous people as if they were strangers" (6-7). Moreover, since Gene Kelly's body was cremated that morning (apparently a rather fast turnaround), the children never got to say goodbye. From Blair: "Kerry later told me they all felt as if 'she threw him away -- as if he were garbage to be incinerated and thrown away. There aren't even any ashes'" (6-7). To date, we are not privy to the other side of this story. Pittsburgh Post-Gazette (clipped by sherindy73) February 3, 1996. But let's move on to a (somewhat) happier note. 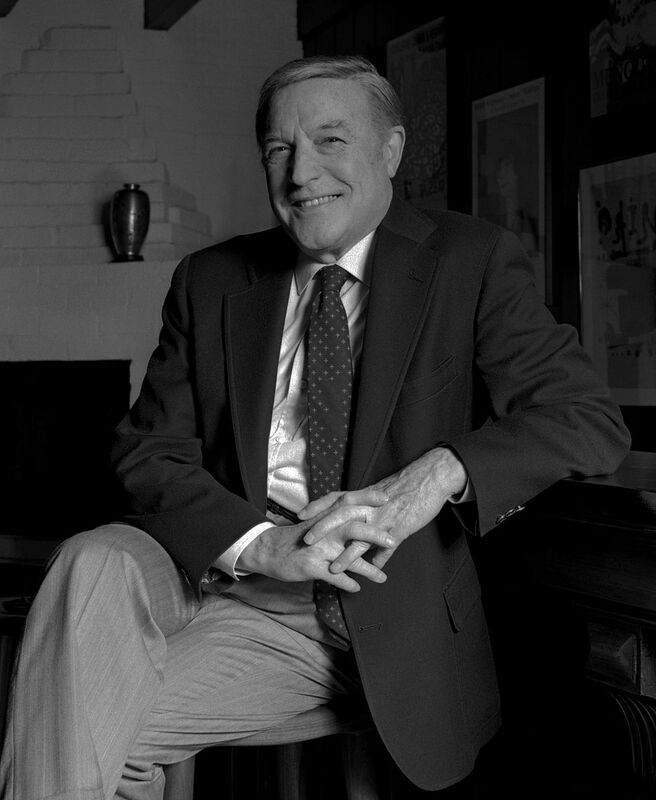 Many tributes were put together during the days and week following Gene Kelly's death. ​For instance, People published a lengthy photo-heavy tribute and The NY Times, this one, which applauded all of the "inventive techniques that enabled Gene Kelly to create unusual and imaginative dance routines." Similarly, The Independent remembered the many hats Gene wore: "As director and choreographer, dancer and singer, acrobat and actor, Gene Kelly was one of the most vital and indispensable figures in the history of the American film musical." For all the effort he and directors like Vincente Minnelli put into balletomanic spectaculars like the 20 minutes that conclude An American in Paris, it is the sweet simple things like "I Got Rhythm" -- just Kelly, some cute kids, a cobblestone street on Montmartre, a catchy little Gershwin tune -- that lived most affectingly in memory. But this, too, is true: we could not have had the one without the other. Together the complexity of his ambitions and the underlying innocence of his spirit constitute the inextricable weave of this dear man's singularity. As well, news stations all over the globe marked Kelly's death with tributes, as did The 68th Annual Academy Awards (embedded below), which features tap-dancer Savion Glover. ​Finally, on the night of his death, the lights of Broadway were dimmed in his honor. RIP, Eugene Curran Kelly. Brozan, Nadine. "Chronicle." NY Times. 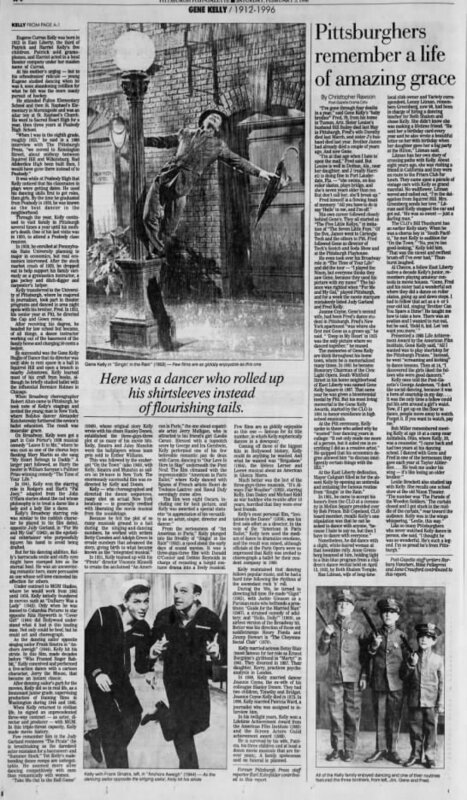 14 Feb. 1995. http://www.nytimes.com/1995/02/14/style/chronicle-936095.html. Krebs, Albin. "Gene Kelly, Dancer of Vigor and Grace, Dies." NY Times. 3 Feb. 1996. http://www.nytimes.com/learning/general/onthisday/bday/0823.html.